Fragrantly sweet with a subtly tart overtone and almost-melt-in-your-mouth texture, raspberries are wonderfully delicious and are usually in limited supply. A member of the rose family and a bramble fruit like the blackberry, raspberries are delicately structured with a hollow core. They are fragrantly sweet with a subtly tart overtone. Raspberries come in black colour too. The glycemic index of raspberries of 32 which falls under low GI category and the glycemic load of ½ cup is 2.7. Raspberries are the powerhouse of health benefits. They are famous for giving your skin a glowing complexion, boost up your metabolism and improves your cognitive abilities. Is Raspberries safe for diabetics? The glycemic load of ½ cup of raspberries is 2.7 which is an ideal option for diabetics. It is recommended for diabetics to have only 45 to 60 grams of carbs per meal to manage the blood sugar levels. Adding more amount of carbohydrates in your meal than recommended will impact your blood sugar levels and lead to further complications. ½ cup of raspberries provides only around 8.6 grams of carbs which should be chosen over any unhealthy high calorie snack. 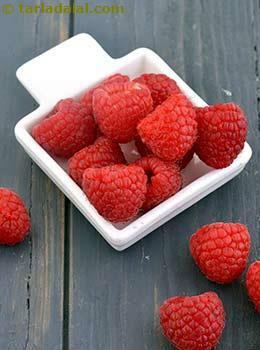 Fiber present in ½ cup of raspberries is 4.7 which aids in slow digestion. Thus keeps your blood sugar levels stable. Raspberries acts as an antioxidant due to huge amount of anthocyanins within it. Anthocyanins remarkably reduces oxidative stress, responsible for heart diseases. Raspberries contains a phytonutrient called as Tiliroside which activates a special hormone called as adiponectin that is formed in our fat cells. Adiponectin brings about blood fat and insulin balance. Thus maintains blood glucose levels. Adiponectin usually remains inactive in type 2 diabetes mellitus. Is raspberries suitable for weight loss? ½ cup of raspberries provides around 38 calories which becomes an ideal fruit to be included in the balanced diet for your weight loss plan. Raspberries provide remarkably high amount of fiber (4.7 grams in ½ cup) which contributes in making you feel satiated for a longer period of time. Rheosmin is a phytonutrient found in raspberries that is responsible for boosting up your fat metabolism and thus less deposition of fats in your fat cells and ultimately lessen the pro-inflammatory markers found in your fat cells- major cause of obesity. Hence have this simple and delicious fruit that offers extraordinary benefits.